Ghost Concert: Sergei Rachmaninoff "live"
The Ghost Concert is a new format of a concert-lecture-show about Sergei Rachmainoff. It was conceived and written by Roberto Prosseda and presented as a World Premiere in Napoli at Teatro Mediterraneo on Dec 5, 2014. In this special concert, Prosseda himself “meets” Rachmaninoff’s ghost on stage and interviews him, between his performances. The recital includes 13 pieces, which Rachmaninoff recorded on piano rolls, and they are performed "live" on stage by Rachmaninoff's ghost. The piano rolls, converted in MIDI and optimized, are played by a Yamaha Disklavier Piano. 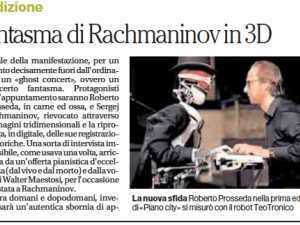 The animated 3D image of Rachmaninoff’s ghost playing the piano is projected on the piano. 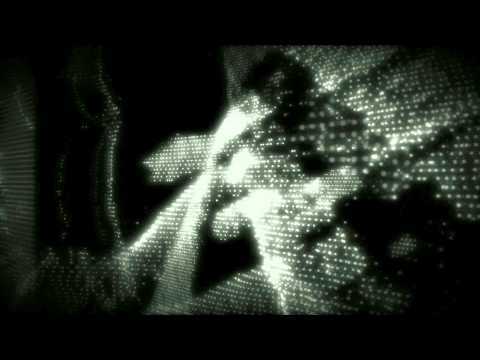 The animated speaking face of Rachmaninoff has been realized by the Italian computer graphic Adriano Mestichella. "This project”, Prosseda says, “has been conceived to bring classical music out of the traditional audience. Only the 2 or 3 per-cent of the people usually attends normal piano recitals, and our goal is to reach the other 98 per-cent of the audience, with an innovative and attracting format, but still focussing on the great music." The contents expressed in the dialogue with Rachmaninoff (written by Prosseda and based on Rachmaninoff’s original letters and interviews) will tell us about his life, his poetic ideas, his suggestions to young pianist, and will introduce his own performances. "These could the same concepts exposed in an academic lecture about Rachmaninoff - Prosseda argues - but with a different approach in terms of communication and format." In this video reportage of the Italian TV Fanpage.it it is possible to watch some excertps of the Premiere show and to listen to Prosseda and Rachmaninoff's feedbakc about their special meeting. The Ghost Concert is now ready to be presented in any Theater, and requires ad adequate video projector and a Yamaha Disklavier grand piano (version from 2006 onwards).